These Succulent Bath Bombs are perfect for beginners. The 4 Cavity Succulent Silicone Mold creates an adorable shape and Lush Succulent Fragrance Oil gives them a fresh scent. 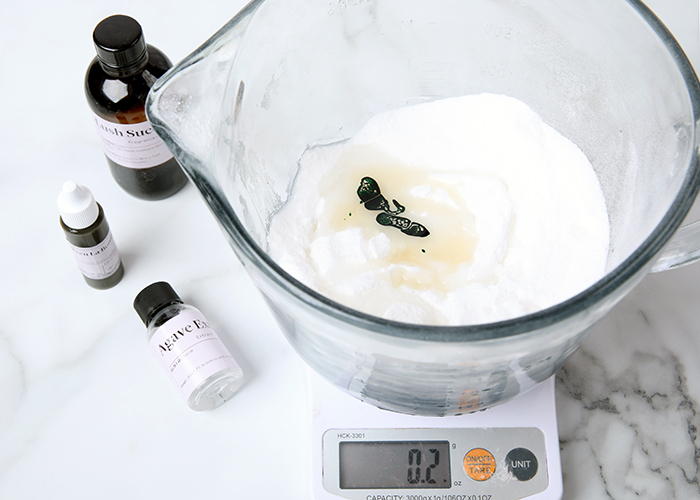 A touch of agave extract moisturizes the skin and helps the bath bombs hold their shape. If you don't have agave extract on hand, any oil-based extract or lightweight liquid oil will work. 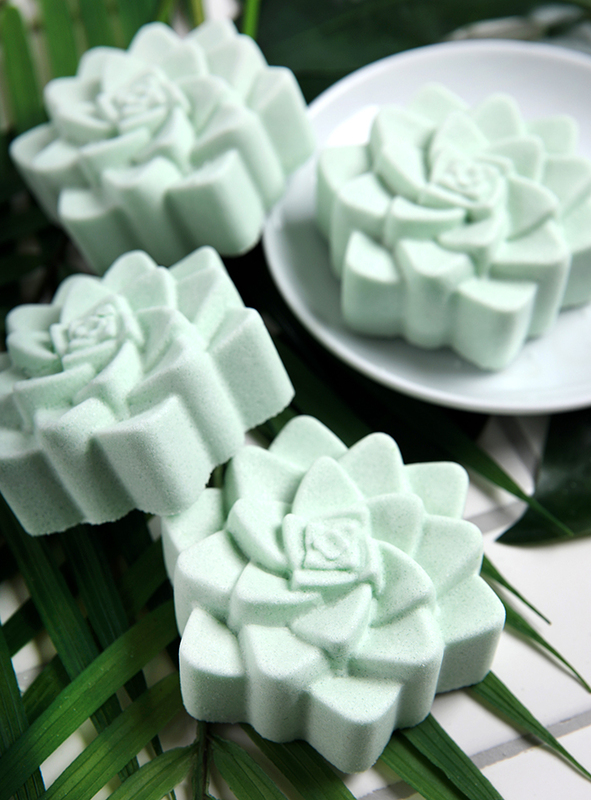 These bath bombs are made with Lush Succulent Fragrance Oil, which has fresh notes of cucumber, honey, and bamboo. Agave extract adds skin-loving properties, Irish Green La Bomb adds a light green color, and the Succulent Silicone Mold creates an adorable shape! In a large bowl, add 12 ounces of baking soda and 6 ounces of citric acid. 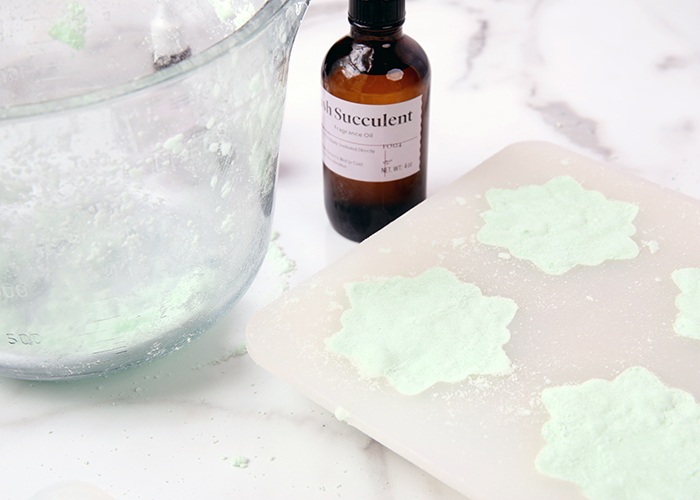 To get rid of clumps in the mixture, you can push the powders through a sifter or break them up with your fingers. Citric acid has a tendency to take off nail polish, so wear gloves to protect your manicure. Thoroughly stir the ingredients together. Add 0.2 ounces of agave extract, 0.2 ounces of Lush Succulent Fragrance Oil, and a few drops of Irish Green La Bomb Colorant. Use your hands to thoroughly incorporate all the liquid ingredients. Add more color if you like. Check the consistency of the bath bomb mixture. The perfect consistency is similar to wet sand and holds its shape when squeezed. If it’s too dry, use one hand to spritz the mixture with witch hazel and one to mix. Continue spritzing until the mixture holds its shape. Begin filling each mold with the bath bomb mixture. Firmly press the mixture into each cavity as much as possible. Allow the bath bombs to dry for at least 4 hours or up to overnight. 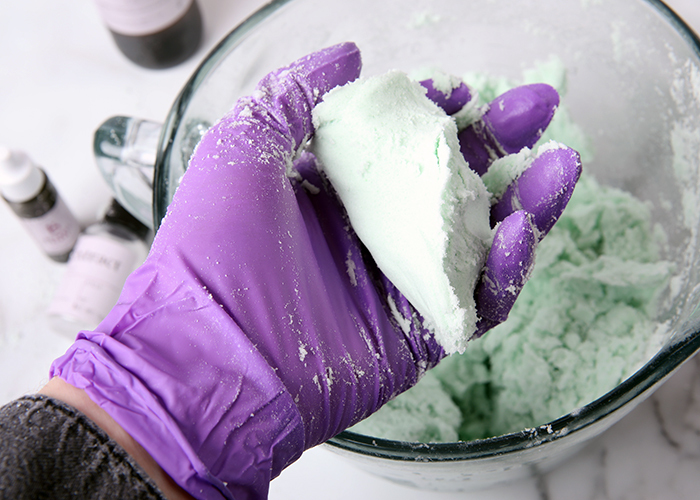 Once the bath bombs are completely dry, gently push them out from the silicone mold. To use, place them into a hot bath tub. Enjoy!